One evening in 1971, at the age of twenty-two, I sat down with a friend who showed me...(with a twinkle in his eye as I recall)... a colorplate reproduction in an art history book. It was a photo of a manuscript illumination from “The Book of Kells” created by Celtic monks around 800 AD. I was astounded and quite literally awestruck at what I saw. And then, of course, it dawned me. The answer to my “What?” to my “How?” and to my “Why?” was a Who. That night was a revelation for me, and a seed was sown in my heart. Someone once said that the natural universe, the creation around us, is “...a kind of corporeal and visible Gospel.” I believe that is true. Likewise I am convinced that the natural universe that we encounter with our senses may be understood as God's “primer”...a first edition prologue text of a magnificent and dramatic story unfolding before us. And the “prologue of nature” beckons to every human heart and soul just as surely as the ancient manuscript illuminations invited the reader to enter the Sacred Texts. I believe the 12th century Christian mystic, Richard of St. Victor, was right when he wrote “The whole of this sensible world is like a book written by the finger of God”. If that is indeed true, then perhaps we ought to sincerely and earnestly seek knowledge of this world's Author and Creator not only through the “word” of nature's pages (what theologians call “general revelation”), but also seek to know Him in and through the verbally communicated Holy Scriptures, the prophetic spoken Word, what theologians refer to as “special revelation”....The Bible. I am persuaded that we are daily being invited to read beyond the elegantly complex and beautifully written Divine Prologue of Nature. We are freely encouraged to press on to discover “the rest of the story”, the special revelation....the Greatest Story Ever Told. “ In the beginning was the Word and the Word was with God and the Word was God. He was with God in the beginning... “The Word became flesh and made his dwelling among us. We have seen his glory, the glory of the One and Only who came from the Father, full of grace and truth.” (John 1: 1,2...14) . Manuscript illumination from the Book of Kells (circa 800) showing the lavishly detailed text that opens the Gospel of John ("In the beginning was the Word..."). 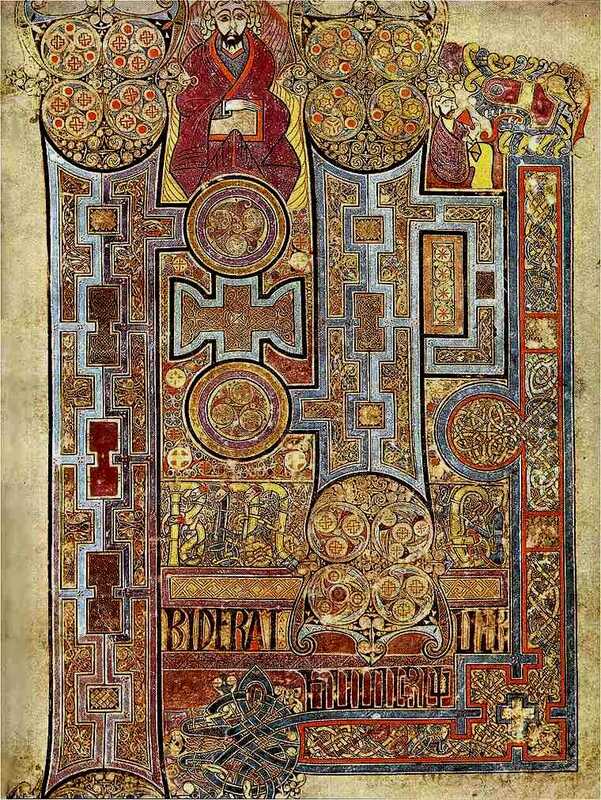 "Book of Kells text illumination (circa 800): "Chi Rho" the first two letters of the word "Christ" in the Greek alphabet." When we feel Your gentle breeze. Help us read between the lines. Strip away our thin disguise. Speaks to every human soul. Tell us how Your plot unfolds..
To the Kingdom's Coming Age.